34/126 Kim Hollis If nothing else, see it for Steve Coogan and Alfred Molina's segment. But Bill Murray is hilarious, too. Back in 1986, director Jim Jarmusch was asked to do a short film for Saturday Night Live. He put Roberto Benigni and Steven Wright together at a table, where they had a goofy and improvised conversation as they drank coffee and smoked cigarettes. 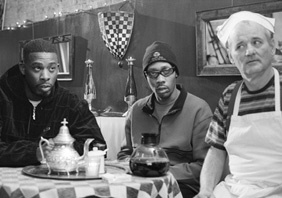 Since then, Jarmusch has filmed many such clips over the years, with the most recent ones taking place in 2003. As time went on, he made the "conversations" more scripted and involved, and the final result is Coffee and Cigarettes, which strings them all together for a complete thematic piece. The cast of the film is quite expansive, and includes such stuff as Alfred Molina and Steve Coogan in a short where they play "themselves," Iggy Pop and Tom Waits in a deceptively passive-aggressive exchange, and Bill Murray in a surreal interaction with the Wu-Tang Clan. The coup de grace, so to speak, is an exchange between Cate Blanchett and…Cate Blanchett.